Shortly after Floyd Mayweather announced on Instagram that he'll put his undefeated record on the line in a rematch with Manny Pacquiao, odds were posted on the fight. He's back, but in many ways he never really left. Floyd Mayweather announced Saturday morning on Instagram that he'll fight Manny Pacquiao this year. Nobody else has said anything officially, although Floyd usually doesn't joke when it comes to his money. Shortly after Mayweather's post, BetOnline hung odds the fight, installing Mayweather as the solid favorite. <a href="https://twitter.com/DaveMasonBOL/status/1040947526369779713" class="embedly-card" data-card-width="100%" data-card-controls="1">Embedded content: https://twitter.com/DaveMasonBOL/status/1040947526369779713</a> Westgate later posted even more narrow odds, with Mayweather -220 and Pacquiao +180. Mayweather's announcement comes on the morning of the [GGG-Canelo rematch](https://www.betchicago.com/gennady-golovkin-canelo-alvarez-rematch-odds), which has dominated this week's boxing discussion. "Another 9 figure pay day on the way," the always-humble Mayweather captioned a video he posted of he and Pacquiao having words last night at a concert in Japan. (No word on why they were both there. Maybe they're just big J-pop fans.) <a href="https://www.instagram.com/p/BnvdWOphIoe/?hl=en&taken-by=floydmayweather" class="embedly-card" data-card-width="100%" data-card-controls="0">Embedded content: https://www.instagram.com/p/BnvdWOphIoe/?hl=en&taken-by=floydmayweather</a> It's hard to make out what either fighter is saying over the music, but it seemed like the 41-year-old Mayweather (50-0, 27 KOs) made reference to Pacquiao's shoulder. The 39-year-old Filipino (60-7-2) famously claimed after their first fight -- a unanimous decision for Mayweather on May 2, 2015 -- that he was fighting with an injured right shoulder. Mayweather reportedly made about $220 million from the first fight, which means Pacquiao raked in around $145 mil in the 60/40 split. 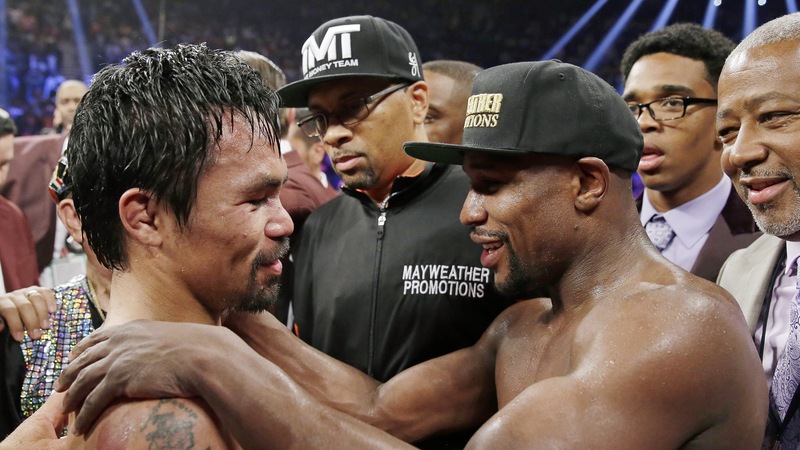 ## Floyd Mayweather-Manny Pacquiao rematch odds BetOnline and Westgate's opening numbers mark a steep decline in Floyd's price from what Bovada posted nearly two years ago on a potential rematch. After Mayweather showed up to Pacquiao's win over Jessie Vargas on Nov. 5, 2016, speculation of a rematch continued. At that point, Bovada installed Mayweather as a -350 favorite to beat Pacquiao again, [per Bad Left Hook](https://www.badlefthook.com/2016/11/8/13567046/odds-already-listed-for-mayweather-pacquiao-rematch). Pacquiao was +275. The odds for the first fight closed at Mayweather -240 (he was as low as -200) and Pacquiao +200 (he was +170 in the week leading up to the fight). Mayweather has fought twice since beating Pacquiao in May 2015 -- scoring a unanimous decision over Andre Berto that September and TKO of UFC fighter Conor McGregor in Aug. 2016. The McGregor fight was the 50th of Mayweather's professional career, and he proclaimed it to be his last. The tightened odds for the rematch has to do with Pacquiao's most recent performance. On July 15, he was dominant in a TKO of Lucas Matthysse in Malaysia to earn the welterweight title. After that fight, of course, Pacquiao was asked about Mayweather. "Mayweather?" If he decides to go back to boxing, then that is the time we are going to call the shots," Pacquiao said at the time. "I have the belt, so it's up to him. If he wants to come back in boxing, let's do a second one." It appears we're on track for that to happen.